While they offer a niche product (plastic heel tips for high heel shoes), Heeltips' products are in great demand, and they ship all over the world. 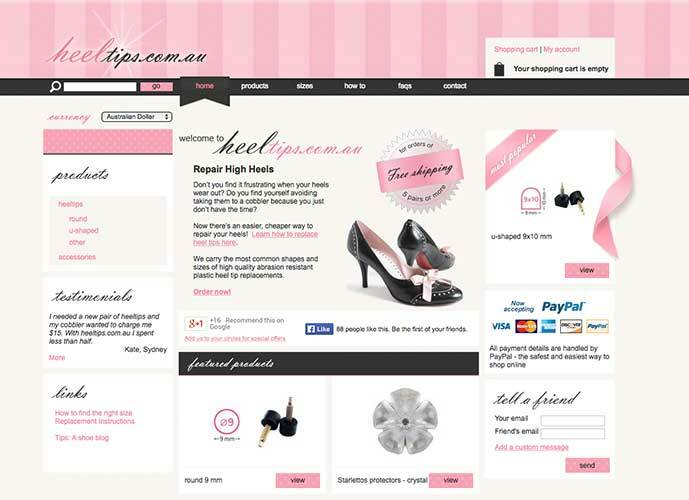 We worked with Heeltips to create an e-commerce system that would showcase their range and support their business processes. Working closely with Heeltips, we designed and built an entirely new website and integrated this with a Kentico CMS. The new solution means Heeltips can now independently add or remove product information at any time, as well as update customer testimonials as soon as they are available. We added sophisticated e-commerce functionality to the solution, enabling customers to place orders in either Australian or US dollars, for worldwide shipping. To make the buying process as logical as possible, we implemented a shopping cart system, and PayPal transactional functionality. We also customised the Kentico user account registration and login functionality to simplify and streamline the ordering process.